A New Blogger in Town! Hey Tek-Ninjas! Back on the 8th of March my colleague Tamika wrote a guest blog for me. It was a great article, and evidently may have helped serve as a catalyst, because Tamika has since then launched her own blog. Tamika will be blogging about being an Occupational Therapist, a single mom, and a Woman of God. Her blog is called TherapymomMe, and I encourage you to take a look at it. Hey Tek-Ninjas! Today I have made a few changes to my blog site. For a while now I have experimented with advertising. You may have noticed on the right side of the blog, a selection of ads. I've decided that the advertisements detract more than add benefit. In addition, I am embarking in a little shameless self promotion. 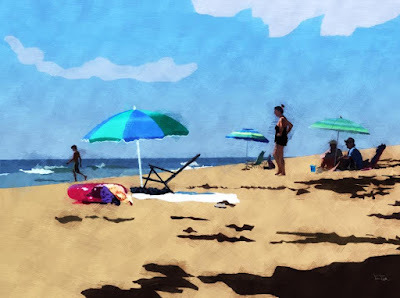 If you note at the top of my blog at the menu bar I have a new link: Jim's Art. 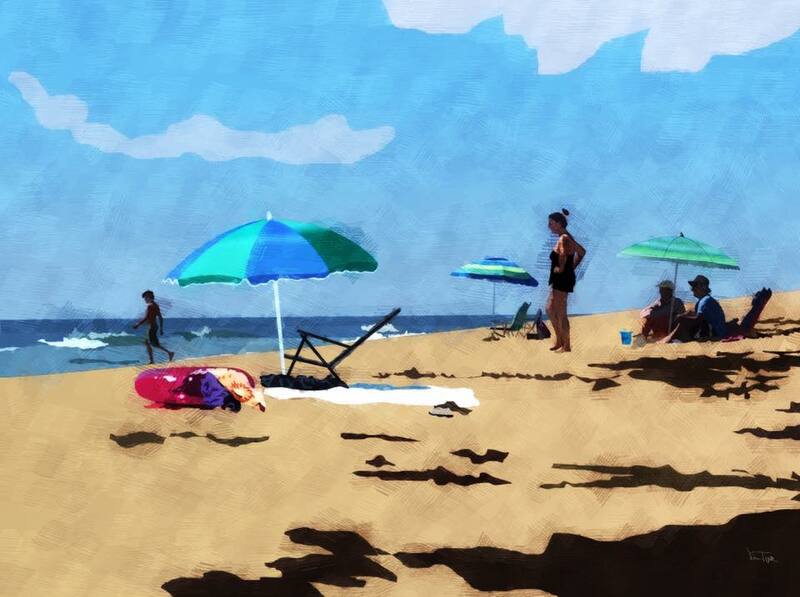 Please take a moment to explore some of my digital as well as oil creations. Hey Tek-Ninjas! Good morning. I just got back from doing my civil duty. I voted. Do you remember the first time you voted? I remember not really being sure how to do it. It ain't rocket science, but it felt intimidating. I would like to encourage you parents of 18-19 year olds to offer to take them to the polls. Explain what the process will be like. Even if you don't think they will vote "your way". Bring them, teach them, then get out of the way! Hey Tek-Ninjas! Recently I went to a local conference called NCTIES here in Raleigh, NC. This is not the type of conference I typically attend, but I may add it to my roster from here out. NCTIES is primarily geared for our gen-ed students, and I typically attend the special ed oriented conferences. Turns out, I have been missing a lot of terrific opportunities. As I was walking through the vendor area I stumbled upon the Ipevo booth. Let me backtrack for a moment. One of the great frustrations I, and others experience in the world of Special Needs, is how expensive things can be. There is always a argument (possibly legitimate) about the small volume of production or the R & D driving up costs. Regardless, equipment is often really pricey. For example, I have some portable "video magnifiers" which cost over $2,000 which we use with a few of our students with significant vision issues. I chafe at the cost every time I look at the device. So. Back to Ipevo. 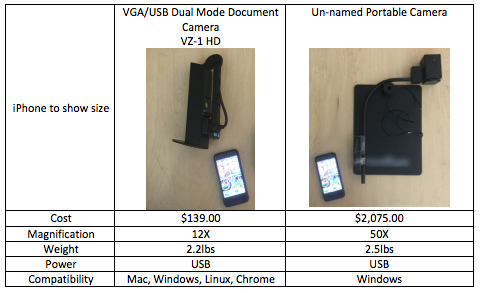 They sell a range of document cameras, along with other technologies. They DO NOT bill themselves as selling products for visually impaired students. But, nonetheless, I was curious to compare. Their products are a fraction of the price. My question was, would they do the job? After sharing my thought process with the very knowledgable and friendly sales rep, Alex, he sent me away with a couple of cameras and an interactive whiteboard system to test. 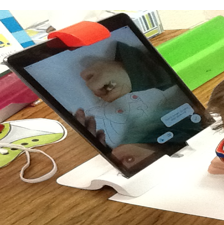 For enlarging work at a student's desk, we found the Ipevo camera did a good job (refer to Fig. 3 for 12x magnification). Where it struggled some, was magnifying work from the whiteboard (not what it is designed for), which the un-named camera did a great job. There is also a question of durability over a few years. Middle and high school students will take their camera out of a backpack, set it up, break it down, and stuff it back into their pack easily 5+ times a day. The Ipevo camera is metal, with a high grade plastic neck and three hinges. It seems durable, but the more expensive competition is all metal with no hinges. But lets be honest, if the Ipevo product needed to be replaced every few years, it's still a pittance of the cost, and then you get the newest upgrades! I am getting ready to assign the Ipevo camera to a student with visual impairment. He's an elementary student, so there is no issue of changing classes. Our VI teacher has given me the go ahead with regards to the magnification being sufficient. We will monitor the student's success with the device, and report back. 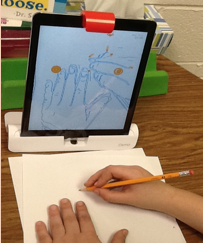 I'm also interested in the iZiggi-HD Document camera by Ipevo, as it works wirelessly with iPads. I may have to try one of those next! Also, I ordered a magnifying lens for $19, which screws onto the bottom of any of Ipevo's document cameras, adding an additional 2X magnification. I'll report on that, when it arrives. I Will Not Fight The Future! This appeared on my Facebook feed tonight, and I thought it was terrific, and apropos. I'm unclear whose Tumblr site I got it from, but it came from here. Guest Blogger: Tamika Harris Occupational Therapist Extraordinaire! Hey Tek-Ninjas! Recently I was in a colleague's office for an Assistive Technology observation, when I was intrigued by some "stuff" on her desk. What, pray tell is this Osmo thing you have here Tamika? Well, Tamika told me about it, and I was impressed. I thought you all would be interested. It's a wonderful intersection of technology and Occupational Therapy. I asked Tamika if she'd like to blog about Osmo, and lucky for us, she agreed. So, below is a guest blog by a wonderful therapist. Enjoy! Welcome to the world of Osmo. 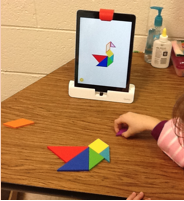 What is Osmo you ask? 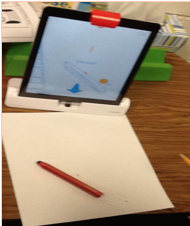 It is an attachment and app that you connect to your iPad. You can connect to a community of educators and download the teacher guide, which contains a list of activities with the appropriate grade level, objective, common core standard and instructions. Content areas for the start up kit include STEM, Spelling, Handwriting, Reading, and phonics. Math is sold separately. In Masterpiece you can draw pictures from the gallery, the iPad’s camera or the Internet and then watch a replay of your drawing with a time-lapse video, which you can even share with parents. Why not turn this into a writing/tracing activity as well. You can take a picture of your student’s name written and have them trace it. Newton is a puzzle game where you have to bounce falling balls toward the target using lines that you draw or by placing objects in front of the screen. Tangram is played by placing the wooden puzzle pieces on the table in front of the camera/screen to match the design seen on the screen. You can pick from a variety of levels. There is a helper at the bottom of the screen to show you what you should do next on the easy level. This helps builds visual spatial abilities, nonverbal reasoning, fine motor skills, and executive functioning. Words is played by placing letter tiles in front of the screen to either guess the entire word or certain letters within a word such as the 1st letter sound. You can play using the several levels already there, download list from the teacher guide or you can make your own list of word. You get two sets of letters and can have two students play against each other. Unfortunately, all of the letter tiles are capital letters. Other than that, I think it’s pretty cool! 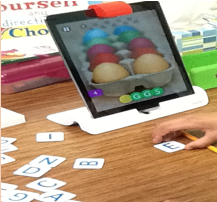 I have found ways to use the Osmo with children with all types of needs such as children with visual impairments, Autism, ADHD, Learning Disability, Developmental delay, etc. All of my students are loving it. Join the revolution! Hey Tek-Ninjas! Lately I have been consulting with staff, parents, and students about recording teacher lectures for later studying. There has been a lot of back and forth about what the legalities are. Before we even jump into that quagmire, let's talk about the efficacy of studying from recorded lectures. When I was an under-grad student as well as a grad student, I recorded lectures for specific classes and studied with them later. They helped augment my notes, and I found them immensely useful. However, when a parent or teacher ask for such an accommodation for a student, I ask them to consider the learner, and the student's learning style. Does the student struggle attending to lectures? Will they learn without visuals? Will they benefit from or even utilize the recording at a later date? I ask this, because often when listening to the professor, without the visual aid of seeing them move about the classroom, and engage students, I often found myself drifting off and tuning the recording out. So, I raise these concerns to say "let's consider if this will be a useful tool". Will he/she utilize the recording? Or, might there be a better way to share class info, such as sharing student notes? Assuming it's worth a try, next we have to consider the legalities. Every state seems different, and there even seems to be some differences within school districts. I encourage you to do some research for your district. My understanding, is that according to the Office of Civil Rights, if a student has a 504 plan in place which lists recording devices as an auxiliary aid, the teacher can not deny them. Similarly, if a student has an IEP, the team may determine that recording a class is a reasonable accommodation. I would add that common courtesy, and the law, dictates that teachers should be informed they are being recorded, and there may be times when teachers ask students to sign "non-sharing" forms, especially at the collegiate level. Without a 504 Plan or an IEP, legally, a teacher may decline to have their class recorded. However, when presented with the request prior to class, I have never had a teacher say no to me. Once established that it is a good route to go, there are many excellent tools out there for a student to use. 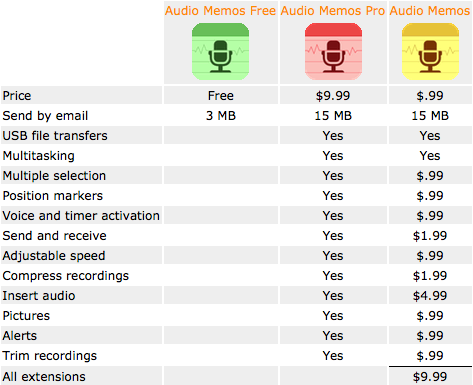 One of my favorites is Audio Memos. 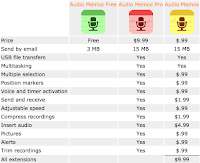 They offer several different apps for your iDevice or Android. I recommend going with the free version first. Then, if the tool has proven useful, maybe considering one of the upgrades based on your needs.